Send automatic, customized email notifications and autoresponders whenever an entry is submitted, updated, or deleted. Add or edit notifications by going into your form → 'Settings' → 'Form Actions'. or click the Email Notification icon to add an additional notification. Give your email notification a Label for easy reference. This label will only be seen on the back-end. Enter one or more email addresses in the To box. The only formats that can be used are 'name <email@example.com>' and 'email@example.com'. To send the same notification to multiple recipients, separate them with a comma.By default, the [admin_email] shortcode will be inserted in the To box. This will send the notification to the email address from your WordPress General Settings page. If you would like others to receive a copy of the message, click CC and insert the email(s) in the CC box that appears. If you would like others to receive a copy of the message but do not want them to be shown to the recipients, click BCC and insert the email(s) in the BCC box that appears. The only formats that can be used are 'name <email@example.com>' and 'email@example.com'. Separate multiple email addresses with a comma. Insert the sender's name and email address in the From box. By default, your website name and admin email address from your WordPress General Settings page will be used. 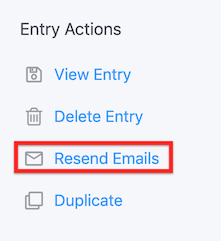 If you want the user to reply to a different email address other than the one the message was sent from, click Reply To, then enter in the Reply To email address. The only formats that can be used are 'name <email@example.com>' and 'email@example.com'. If you want to use the name and email that was submitted in your form, you can do so by typing in  <>, where  is the sender's name, and  is the sender's email address. Add a subject in the Subject box. By default, the [default-message] shortcode will be inserted in the Message box. If you would like to customize the email message, jump to Customize the email message. Scroll down to Trigger this action after and select one or more of the following: Create, Update, or Delete. If you are running the lite version, these options will be hidden and the form action will be triggered on 'Create'. Please note: When the 'Send Emails in Plain Text' option is checked, the email will look exactly how it is in the 'Message' box. Otherwise, you will have to add line breaks with HTML. After setting up your notification, test it out by submitting an entry in your form. Email notifications should be sent to all To, CC, and BCC email addresses. If the email notification does not show up in your inbox, please see this FAQ page to find a solution. Follow steps 1 and 2 in the Set up an email notification section. If users will be logged in when they fill out the form, insert [113 show="user_email"] in the To box. Replace '113' with the ID of the UserID field in your form. If your users will NOT be logged-in when they submit this form, put  in the To box. Replace '112' with the ID of the email address field in your form. Follow steps 4-8 in the Set up an email notification section. If you want to send a different email for each recipient, you can create a separate Form action for each one. Suppose you want to send a Thank you message to your users and a copy of the completed form data to your admin, follow the instructions below on how to set it up. Add an email notification form action. Set the TO field to send it to [admin_email]. Add the [default-message] shortcode in the Message box which will send all the completed fields to the admin. Add another email notification form action. Set the TO field to the user's email address field ID/key in your form. See more information on how to set up automated messages to the user email address. In the Message box, remove the [default-message] shortcode and replace it with your own Thank you message. You have three main options for customizing your email notification content. Add anything you would like before or after the [default-message] shortcode. 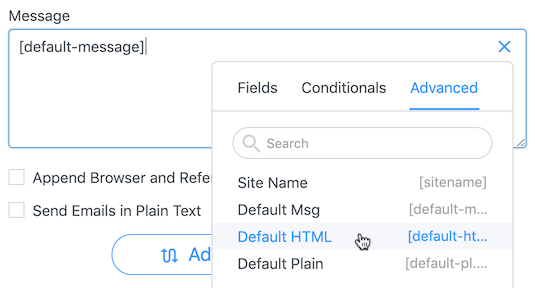 The default message includes any completed fields in the form. If you would like to modify the default message, jump to the default message parameters section. Customize the default message by selecting 'Default HTML' or 'Default Plain' from the right sidebar. This will insert the HTML and shortcodes for the current default message. This code is not dynamic and will not update automatically if fields are added to or removed from your form. The following parameters can optionally be used to alter the output of the [default-message] shortcode. plain_text - By default, the default message displays the content in a table. You can remove the HTML and display only the text by including plain_text=1. user_info - Display user information in the default message, including IP address, browser, and referring URL. include_blank - Include blank fields in the default message. font_size - Determine the size of the font, in pixels. text_color - Determine the color of the text, in hexadecimal form. border_width - Determine the width of the border in pixels. border_color - Determine the color of the border in hexadecimal form. bg_color - Determine the color of the background in hexadecimal form. alt_bg_color - Determine the background color of the alternating rows in hexadecimal form. There are three ways to route emails, depending on what you want to accomplish. Conditional Logic: Send a different email to all recipients, using the Conditional logic approach. Separate Values: Send the same email to all recipients, using the Separate values approach. Dynamic Field: Send the same email to all recipients using email addresses that were entered in another form with the Dynamic field approach. To further customize email routing, refer to the frm_to_email page for commonly requested custom code examples. If you would like to send a different message to each recipient, you will need to use Conditional Logic. Suppose you have three departments in your company: human resources, housekeeping, and billing. You also have a form on your website for people to leave an inquiry. You want to send human resources an email notification regarding the inquiry only if it is applicable to them. The same is true for billing and housekeeping. Go into your form. Add a 'Dropdown', 'Radio', or 'Checkboxes' field called 'Departments'. 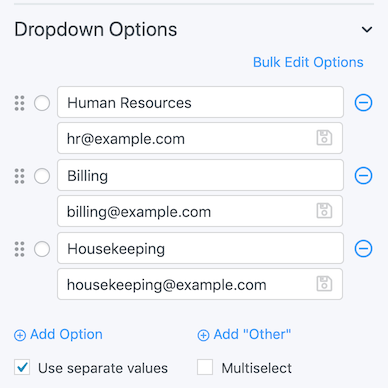 In this example, you would add the options 'Human resources', 'Billing', and 'Housekeeping'. When your users fill out the form, they will select the department related to their inquiry. Go to your form → 'Settings' → 'Form Actions'. Click the Email Notification icon to add a new notification for each department. Now, human resources will get an email notification only when the submitted inquiry is relevant to their department and the email content will be unique for each department. If you would like to send the same email notification to all recipients, but the recipient changes based on a field in your form, you should use Separate Values. Suppose you have three departments in your company: human resources, housekeeping, and billing. You also have a form on your website for people to leave an inquiry. You want to send human resources an email notification regarding the inquiry only if it is applicable to them. The same is true for billing and housekeeping. Add a drop down or radio field to your form. Check the box to 'Use separate values' in the field options. Add the department for the displayed value and the email address for the saved value. When your users fill out the form, they will select the department related to their inquiry. Update your form and go to 'Settings' → 'Form Actions'. Add a new notification and click on the To box. 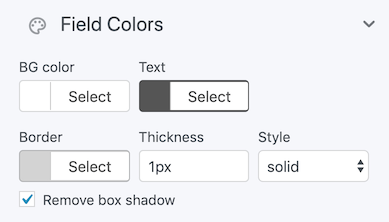 Then click on your dropdown or radio button field in the 'Customization' sidebar to add this field to the To box. Add show="value" to the field id that was added to your To box. Now, if the user selects human resources as the department, the email notification will be sent to human resources. If you would like to send the same email notification to all recipients and the recipient should change based on a field in your form, you can use a Dynamic Field. One advantage of this approach is that there is no way to see the possible email addresses, even when inspecting the page. Another advantage of this approach is that it is dynamically populated using entries from another form. Suppose you have three departments in your company: human resources, housekeeping, and billing. You also have a form on your website for people to leave an inquiry. You want to send human resources an email notification regarding the inquiry only if it is applicable to them. The same is true for billing and housekeeping. Create a new form titled 'Departments' for this example. 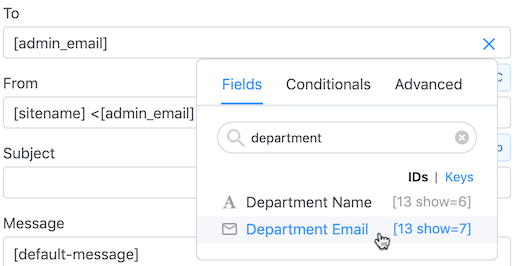 Add two fields to this new form: one Single Line Text field, for the Department Name, and one Email Address field. Now, return to the form your users will be filling out and add a 'Dynamic Field'. Go to Import Options From: and select 'Entries from a form field', 'Departments', and 'Department Name'. Select to display as Dropdown, Radio buttons, or Checkboxes. When your users fill out the form, they will select the department related to their inquiry. Add a new notification and click on the To box. Then click on the Department Emails field in the 'Customization' sidebar to add this field to the list of email recipients. There may be times when you would like to users to be able to email another user on your site while keeping the To email address completely hidden. If you want your users to be able to send a message without ever seeing the email address, follow the directions below. Add any other fields that you would like to, including a paragraph field for entering a message. Go into your Send a Message form's 'Settings' → 'Form Actions' → 'Email Notification'. Insert [x show=y] in the To box. Replace x with the ID of the Dynamic field in the "Send a Message" form. Replace y with the ID of the email field in the linked form. Publish the "Send a Message" form on a page. If you have not already done so, create a View where users will be able to select an individual to email. Add any information you would like to your View. You must also add a link which will send users to the page where your 'Send a Message' form resides. Add a parameter to the end of the link in your View. For example, <a href="siteurl/send-a-message/?to_name=[id]">Mail</a>. This will attach the entry ID to the url. If you would prefer to insert the form inside of the View, you can publish it like this: [formidable id=x to_name="[id]"]. This is the label or title for the email notification. It will only be seen by the admin on the back-end. The email address where you would like notifications to be sent. By default, your website name and admin email address from your WordPress General Settings page will be used. If you do NOT want to receive email notifications, remove '[admin_email]' from this line. To send the same notification to multiple recipients, separate them with a comma. If you would like the user submitting the form to receive the email notification, select the email address field from the options in the Customization panel (right sidebar). If your users will be logged in, you can insert the User ID field here to send the notification to the email address in their account. If you would like others to receive a copy of this message, click on 'CC' then insert their email(s) in the box. Multiple emails can be used but must be separated with a comma. If you would like others to receive a copy of this message but don't want them to be shown on any other recipient's copy then click on 'BCC' and insert their email(s) in the box. Multiple emails can be used but must be separated with a comma. The name and email address the email notification will be sent from. By default, your website name and admin email address from your WordPress General Settings page will be used. Test the email with your selected From address. Emails will be much more reliable if you do not use a user-provided email address. For example, Yahoo does not allow PHP to send emails from yahoo.com accounts. In order to help increase deliverability, Formidable will send the email from wordpress@yoursite.com instead of a Yahoo address that will fail. If you would like the user to reply to a different email address other than the one the message was sent from, then insert it here. The subject line for your email notification. The content of your email notification. If you would like the email to contain a copy of the completed form, the easiest option is to use the [default-message] shortcode. If you would like to modify the default message, jump to the default message parameters section. Append the user IP address, browser information, and referring URL to the email notification. This will also include user tracking information if you checked the box in the 'Formidable' → 'Global Settings' to 'Track referrer information and pages visited.' The user IP address, browser information, and referring URL is automatically stored when the entry is submitted and is accessible with the entry as well. Plain text emails don't support bold, italic, colored fonts, or other text formatting, but plain text emails are universally supported by all email clients. HTML can increase the chances of email being flagged as spam, so if you are having trouble with spam blockers, try sending the email as plain text. Also, if you create a custom message without any HTML, check this box so hard returns will be seen in the email. Email notifications can be sent by scrolling down to Trigger this action after and selecting one or more of the following; Create, Update, or Delete. You can further customize when a notification will be sent by using conditional logic. Conditional logic for emails is a pro-only feature. Send a notification only if certain conditions in your form are met. For step-by-step instructions on how to use conditional logic to route email notifications, jump down to Email Routing. If you would like to resend an email, follow the steps below. Go to the Formidable → Entries page. Select "view" or "edit" under the entry you would like to resend. Click the option labeled "Resend" in the menu on the right. This will send all email Form Actions that are set to be triggered when an entry is created. After clicking "Resend", a list of email addresses will be displayed. Each of these email accounts should receive an email. In most cases we discover that emails leave the website correctly, but are sanitized or deleted before delivery by internet spam protection measures. Because spam protection rules are constantly getting stricter, a form that previously worked can sometimes stop working out of the blue, even if nothing has changed on your website. To check if your Formidable emails are actually being sent, you can install a logging plugin such as WP Mail Logging. If the emails are not being sent and doesn't arrive in your inbox, follow the steps on the Frequently Asked Questions page to try and solve the problem. There are a few different scenarios where the new Gmail interface will ignore the Reply-to address in the email header. If the To address is the same as the From address, Gmail ignores the Reply-to header information. This looks unusual and can trigger spam deletion. To get this working, you will either need to change the From address or the To address in your email form action. If the From address is a registered sending account in Gmail, the Reply-to is ignored. To avoid email messages being marked as spam, configure your site to send all emails using an SMTP server. SMTP sends messages in a way that looks more legitimate than the built-in WordPress mail service, and helps your messages pass spam filters. Your FROM address MUST match the domain of your website. It is often best to setup a dedicated email for this, like noreply@mydomain.com. Your TO address should never match your FROM address. This looks unusual and can trigger spam deletion. If you specify a REPLY-TO address, it should never match your TO address. While you can include multiple addresses in your TO field, it is best to use the CC and BCC fields for additional recipients. Many spam filters are triggered by too many recipients in one email. For large lists (50 or more recipients), consider a service like Sendgrid or SendInBlue. Minimize the links you include. Email messages with lots of links may trigger spam filters. If there is code showing in your email, please see the steps to get rid of HTML in the email. There are times when the email you receive comes from a different email address than you have included in your email settings. If the email is sent from wordpress@yoursite.com, this means you are trying to send emails from a Yahoo address. See more detail on this issue above. Another possibility is that you are using an SMTP plugin. This type of plugin is designed to send from a single email address configured in the SMTP settings. We recommend that you use the Reply To option to set the email address you would like. The From email address may also change if you are sending emails through a transactional email service like SendGrid. This is similar to SMTP, where the from email address is not generally dynamic.